To most the words ‘bespoke’ and ‘personalised’ often send fears of long delivery times, big setup costs, high minimum orders and complex ordering processes. At Glenway they aim to completely change this for 2019. Every event should have the option of a medal or award that stands loud and proud using their logos or personalisation without having it tucked away on the reverse of a medal or a small engraving plate. Glenway have been offering traditional bespoke medals to custom designs and engraving for a number of years but with times now changing and a bigger need than ever for all things bespoke, they have set about revamp their services department alongside their biggest ever new selection of all things bespoke and personalised, packed into a new 36 page brochure. Bespoke Medals are becoming more popular than ever but theres always that one big question that gets asked, Exactly what is possible? The answer is anything! Many people tend to keep to traditional shapes and sizes but at Glenway there is nothing that can’t be achieved. The only real limitation is the lead time they are given and the imagination of their customers. You can leave all the detailed production variations and design to Glenway as it’s all included within the new prices. On the talk of new prices Glenway have been hard at work changing the way the bespoke medals are priced and delivered. There will be two delivery times available both with their most competitive pricing yet! Showing what can be achieved is always difficult when the item you’re selling doesn’t even exist yet. They realise it’s difficult showing what’s possible from a glossy brochure so they have produced Trophy Street Bespoke sample medals for you to showcase. Glenway have samples available so if you could not attend Trophex Live 2019 please do not hesitate to get in touch for yours. All artwork and design is always free of charge and they love being put to the test. Never hesitate in giving them a challenge; whether you have full vectored images or just a sketch Glenway are here to help. Halo Medals brings a complete new rethink on how Glenway offer medals and personalisation. A traditional metal medal with engraving is always well received but the most important details are always hidden away. Halo medals change this completely allowing the outer edge of the medals to be personalised with any wording in any colour combination. The added bonuses to this medal seem to be endless. Not only is there no limit to the wording or colours possible there are no setup costs and no long delivery times with production taking just a couple of days. Better still if the customer doesn’t use all of what’s been ordered they can just repersonalise them for the next event. Personalising a medal with a logo usually consists of a 25mm insert in a medal. We all know this great budget option is always a guaranteed winner which is why Glenway have considerably increased the range of insert medals for 2019 but there has always been a missing middleground. Not everyone wants a budget medal yet not all can stretch to a fully bespoke option with setup costs and a longer lead time. So Glenway have ensured for 2019 there are options for all budgets with medals that are designed with personalisation in mind rather than just as an added bonus. All this talk of medals, what about trophies? It’s no good having bespoke or personalised medals without a trophy to match! 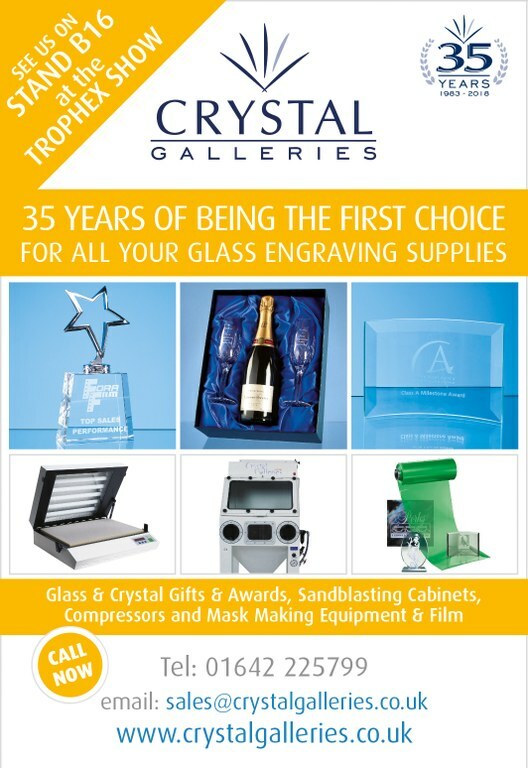 Well don’t worry their new Cosmos range and printed glass take care of that complementing the already popular engraved glass and crystal. The trophies, as with medals come in a range of styles to suit all budgets and tastes.